I spent the morning quilting and I have finished the two quilt tops. I think they are looking fun. 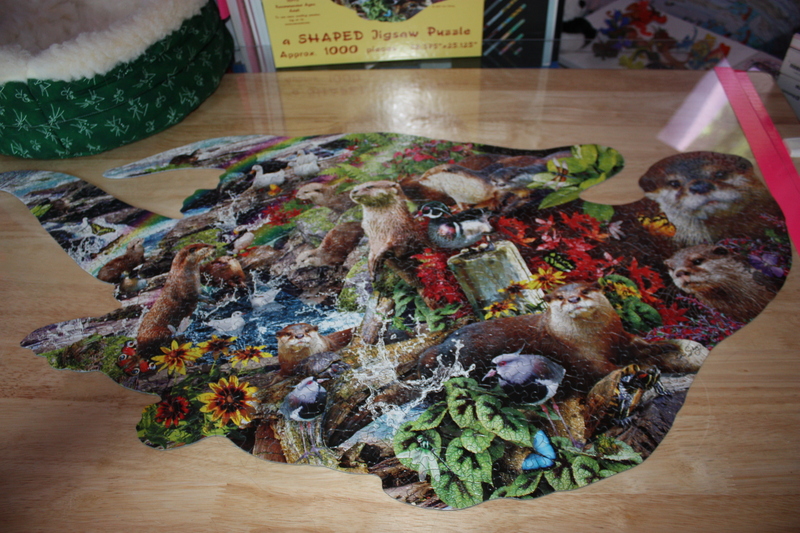 And then I worked on my otter puzzle, and I managed to get it finished. Turns out the odd shaped pieces were not actual pieces. I’m not sure why they were included, but they’ll be handy for making extra pieces if I loose any. Finally, I cataloged a few books for Student Link. Because if it is, it’s AMAZING. It would be amazing for sure, but know, that’s the otter puzzle. But maybe it will give me ideas. Thanks! My grandson had a shape puzzle – a firetruck. Thankfully it only had about 24 piece – but they covered a large part of the floor! Kinda tough when you don’t have regular edge pieces. Old about the odd pieces. Picked up a 48 piece Cars Puzzle – with just a little assistance from Grama – I think he had fun with it. Love the garage sale puzzles for .50. Thankfully all of the pieces were there! The shape puzzle was different, but fun and very pretty. Puzzles are great for kids! Enjoy!